What do you do to get away from Triathlon? One of the best places on earth - the Kimberly's. Another of gods greatest presents to Oz. I head away on my Kimberly trip next week and I'm nearly ready, hooked up the big 250 Watts oar panel yesterday, it all works perfectly, very happy with how it has all come together. Just make up a few Led light strips to hook up to the gazebo for some light and re do the LED light in the canopy and then I just wait until i finish at work next Wednesday and head off, 1st stop will be coral bay and exmouth to pick dad up, then inland to tom price and karinjini, before dropping back into Karratha for a night and offload the wife and kids, then Dad and I will head off north. Looking forward to it. Sounds awesome. Hope it's everything you are wanting, and more. I did three weeks from Perth to Darwin in May. Loved it. Hey Keiran. What did you use to attach the solar panel to the Rhino rack? Just a L bracket or is there some fancy Rhino attachment to do it? Mate its very simple what i do because I'ma very simple person, i just found some spare little rhino bits, they just have a square base with the bolt threat on them, drop them in the slots on the rack, drilled a hole in the frame of the solar panel, spring washer, washer and nylock nut. As it tightens its spins the base around and locks up tight on the rack.. I have 4 batteries in this Ute, crank battery, then a 100 amp marine battery under the bonnet, i went with that because of the heat and AGM's don't like excessive heat, the marine battery is only running aux power to all my 12 v points and the compressor, also wired it up to be able to jump start the Ute if the crank one dies. Then i have 2 100 amp deep cycle AGM in the back, running the two fridges, one as a freezer, i wanted to have the fridges independent of everything else, so I've got shitloads of power. everyone is saying the 250 watt panel is way overkill, but in reality it's not, i worked out the amp draw on the two fridges and If im stationary for a few days i will need the big panel to keep everything how i want it. My dad also has a sleep apnea machine, and ive worked out i can run his machine off the marine battery for approx 2.5 nights without having to charge. the solar panel does not supply the marine battery. Thanks for that. Simple works for me too. Off to eBay to see what I can get. Not sure I want to know about the gorges in your budgies, favourite or otherwise, though I hope you have enjoyable trip all the same. Still a long way to mastering watercolour painting but also trying my hand at Gyotaku ( fish rubbing ) using acrylic inks. Only done a few so far with mixed results. I need to get the technique right and the method to the final detailing when the rice paper is removed. Also bought a new set of 36 Faber Castell Polychromos pencils....now, they are something else to use. This is what I'm trying now, since I cant do Tri's any more. Takes a lot more balance than I assumed. Abs get a hammering first few attempts. Haven't been able to go far enough yet to give the shoulders/ arms/ chest a real workout yet but looking forward to it. So since the garage was looking awful empty I picked up another ski cheap on ebay. Bit thinner and longer and a bit trickier to keep upright but I'm managing ok so far. Roxii, my mate does outrigger canoe paddling. Some races up to 25 kms, including paddles out Sydney Heads He loves it. He can still ride his bike but running is very low now due to leg problems. He is probably the fittest I've ever seen him. Who will be the person nominated to "store" their skis at your place? Nah with all the bikes and stuff I sold I’m way in front. Mrs is sweet on the new hobby and is pushing me to splash out on a shiny new one. Just check she hasn't recently insured your life. Enough of Kieran & Roxii. I've just made a trip up the coast to satisfy my "vice". I'll get these in the ground tomorrow. About 40 new plants all up. It should be fun digging the holes in 35+ heat. Definitely not at the moment Every thing is your typical south coast green . the last few months being in the ocean at least 3 times a week minimum has worked wonders ! This one was really tricky - small and fiddly with lots of rigging. Anyone whose been through the arrival hall at Mascot domestic will recognise it (which is where I got the idea to build it). In the early 70's on the 50th Anniversary of Qantas, Airfix made a special 1/72 scale limited run version of this aircraft for Qantas which was handed out free to some Qantas passengers. It is now one of the rarest model kits in the world, and sells for over $10K. 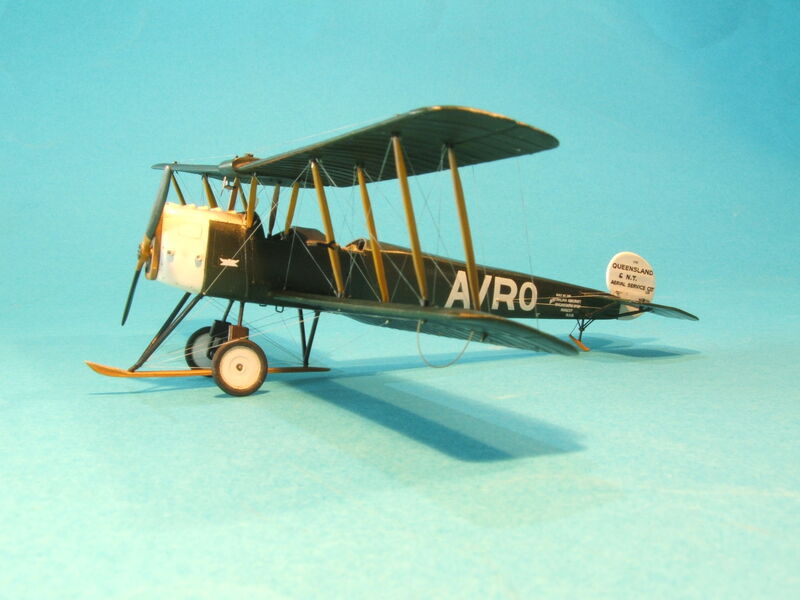 But I had to use the basic 1/72 Airfix Avro 504 kit , and massively modify it using resin, plastic card & bit of old drink can, as the 1920s Qantas plane had a completely different engine & nose shape. With a 20c piece to show actual size. Looks like im going to have myself a new little dive buddy soon! she had an absolute blast on her intro to diving course yesterday and cant wait until she turns ten this year so she can get her junior open water dive ticket. Sydney Harbour Kayaks is still there, it's one of our "go to" spots when we have visitors! Whistler today after a powder dump last night. My yong son in red. Brother in Flour.